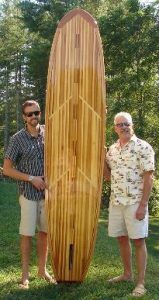 The Cruiser 9'6" - Goosebay Sawmill and Lumber, Inc. The Cruiser longboard with retro 50-50 rails for that sweet paddling nostalgic feel or harden them up with modern contour that turns on a dime and hugs a wave tight. It has just enough rocker to be forgiving on late takeoffs but still has speed down the line. Be prepared to spend some serious nose time with this board.